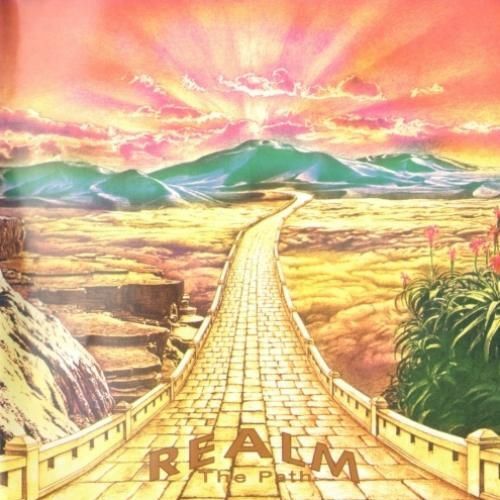 Realm is not a new band: well over ten years ago a nearly identical lineup produced an almost unlistenable (due to the muddy mix and horrible vocal arrangements) keyboard album under the name System, titled Realm Time Tales. That album hinted at the wizardry of Wakeman and the light vocal styles of Jon Anderson, but there was no convincing evidence that, ten years later, they could become an almost near-perfect clone of classic period Yes... well, maybe not the real classic period, but much of the material on The Path will easily give Going for the One a run for its money. The band today is Lake Furney on drums, Steve Vail on Kurzweil 250, grand piano and Moog bass, and Darrel Studna on lead vocals and guitars. Of course Studna is no Steve Howe, and the Moog bass doesn't have the feel of a Rickenbacker (note Studna does contribute real bass guitar on a couple tracks), but the spirit of the music is there; one can tell at the very first listen that these three guys worship old Yes, and everything they ever did. It's not until the third or fourth listen that one starts to notice the differences. So is this a good album? The musicianship is certainly good and the compositions are original enough (there are no overtly stolen licks here); it's just that in judging an album, the greatest weight in my opinion should go to originality of the overall style, and this band has very little personality of its own, with a couple of exceptions. But if you like the sound of old Yes, and you never got enough of it back then, I'd surely recommend picking this one up before wasting your money on Talk. Wait a minute! Do my ears deceive me or is this a long lost Yes release? No, it is the debut release by the mid-western group Realm and could easily be the best Yes release they never recorded. Hailing from Kansas City, Missouri, Realm is Steve Vail (keyboards and synths), Lake Furney (drums and percussion), and Darrell Studan (guitars and vocals). Studan's voice is a dead ringer for Jon Anderson and Vail has his Rick Wakeman chops down pat. In fact, both Studan and Vail extend a special thank you to Rick Wakeman for his help with this album. Most of The Path is a tribute to God and nature. Off by itself is "Little Bottle," a protest song about the atrocity of Tianamen Square. The high point of the CD is the title track, an upbeat song about death and the afterlife making use of unusual timbres. The beautiful artwork (akin to the psychedelic guru contemplation art of the late 60s), full color picture disk, and the CD booklet with nature photographs, lyrics, and band photos makes for an artistic and pleasurable package. Dušan Jevtović - "In the Last Moment II"